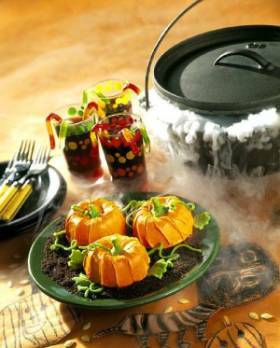 Serve these little pumpkin cakes for a children's Halloween party or can be served for an adult get-together also. You will be surprised how delicious these mini pumpkin cakes are. The cake batter is made with pumpkin puree, white and dark chocolate, mixed fruit bits and chopped walnuts and other goodies. When ready to serve, cut cakes in half, making enough servings for 6 people. 1. Preheat oven to 350 degrees F/180 degrees C. Coat six mini bundt cake pans with nonstick cooking spray or vegetable shortening. 2. Beat butter and sugar in bowl until light and fluffy, using electric mixer at medium speed. Add eggs, one at a time, beating well after each addition. 3. Mix flour and baking soda. Add flour mixture, pumpkin, lemon zest, lemon juice and milk. Using a wooden spoon, stir until ingredients are blended. Do not overmix. Gently fold in chocolate, white chocolate, fruit bits and walnuts. Divide batter among prepared pans. 4. Bake for 20 minutes or until a toothpick inserted into each cake comes out clean. Remove from oven and cool 5 minutes. Turn onto a wire rack and cool completely. After frosting and decorating the cakes and when ready to serve, place cakes on a platter and slice each in half to make 6 servings. 1. Place cream cheese and butter in large bowl. Beat on high speed until smooth. Gradually add half of the confectioners’ sugar, beating on low speed. Add the lemon juice, orange food coloring and remaining confectioners' sugar and beat until smooth. 2. Cut tops off cakes so that they are flat. Using a small spatula, frost the flat sides of each cake and "glue" together to form a pumpkin. Repeat with the remaining cakes. Frost the outsides of the pumpkins with the frosting. Refrigerate the cakes. 3. Knead the marzipan and a bit of green food coloring until color is blended. Sprinkle a bit of confectioners' sugar on work surface. Roll out marzipan to 1/4-inch-thick. Using a sharp knife, cut out leaf and stalks shapes. Let them air dry on a baking sheet for 3 or 4 hours before decorating pumpkin cakes. Makes 3 (4-inch) pumpkin cakes, 6 servings (if each cake is cut in half).